Description：The Hong Kong-Zhuhai-Macao Bridge has got off to a good start, serving about 1.79 million passengers in the first month of smooth and orderly operation, the Ministry of Transport said on Thursday. 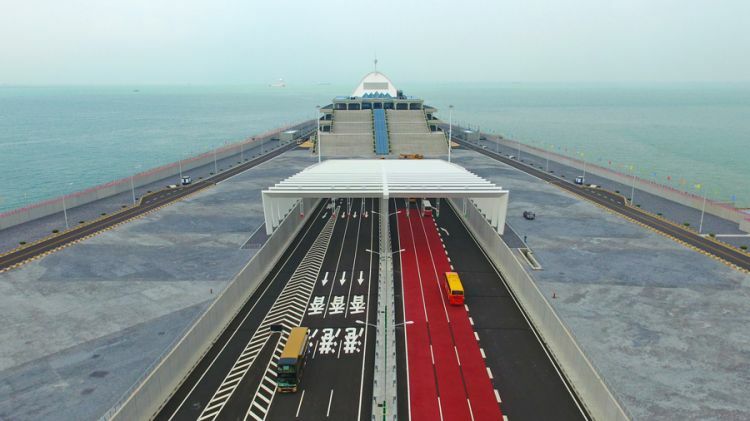 The Hong Kong-Zhuhai-Macao Bridge has got off to a good start, serving about 1.79 million passengers in the first month of smooth and orderly operation, the Ministry of Transport said on Thursday. As of midnight on Tuesday, the bridge's daily passenger volume reached 64,000, with the highest hitting 103,000 on Nov 18. "The figures exceed our expectations," said Yiu Si-wing, who represents the tourism sector in the legislature of the Hong Kong Special Administrative Region. He added that the bridge's first month of operation had a positive impact on the city's tourism industry. Yet, he admitted that the immediate benefits are not as significant as he had thought they would be. He mentioned that perhaps 20 percent of the passengers who used the boundary-crossing bridge were there just to "worship the bridge". They had no intention of entering Hong Kong. Moreover, Yiu said, for those who did enter Hong Kong via the bridge, the majority were on one-day tours, bypassing hotels and tourist spots or resorts. Passenger vehicles represented up to 97.6 percent of the total traffic on the bridge, according to the ministry. Shuttle buses accounted for 45 percent of the total vehicle traffic, with private cars making up another 30.5 percent. Cargo accounted for 2.4 percent. Rush hours were from 10 am to noon and 5 pm to 7 pm, the data showed. "We saw no traffic congestion on the bridge at all," said Teddy Chung Wai-tong, vice-chairman of the Hong Kong Macau Cross Border Association. But he said that passenger congestion did occur on weekends as people gathered to wait for shuttle buses. Shuttles on the bridge carry passengers to the three border checkpoints in Hong Kong; Macao; and Zhuhai, Guangdong province, while crossborder coaches can send passengers to downtown areas in the three places. Chung hoped the Hong Kong government would increase quotas for the crossborder coaches to ease the burden of the shuttle buses. He cited his own company, One Bus Hong Kong Macau, as an example. The company provides cross-border coach service between Hong Kong and Macao. "We can only serve a maximum of 5,000 passengers a day because of the quota restrictions. But the daily volume of passengers traveling between Hong Kong and Macao may climb to 30,000 on weekends," he said. But to Yiu, the quota increase doesn't seem urgent. "Since the bridge has only been open to traffic for a month, it would be better to consider and review the quota policies after further observations have been made over a longer period." The bridge officially opened on Oct 23. Its 55-kilometer-long complex of bridge structures, tunnels and island crossings connect the east and west sides of the Pearl River Delta in South China.